A narrow lane ends at the edge of the bay. Metal Signs suggest distant destinations to the left and right down a county road that parallels the sea. There are no near destinations. Other signs suggest a storm. The wind smells of it. The grey sky portends it. The water dropping intermittently on my face whispers a challenge. Perhaps it was the brashness of the gust of wind off the water, the challenge of the dark clouds spitting water, or maybe just my own mood, I don’t know, but the gradual twist of the throttle I had intended to calmly introduce my bike and myself to the morning’s ride through the storm became something sharper, more insistent. The sudden roar of the bike called to me in a way more than just the sound, more than just the physical surge of a powerful machine – something more than both simply added together. It was a wild call, and the thing inside me that answered was equally wild. It was the call of a wolf with quarry in its nose. It was a call to its pack, to the hunt. Something in my gut I answered. With The surge of speed beneath me, I felt my gut tighten with millennia-old instinct, reaching out, pulling together my arms, my legs – all of me responded and pulled together on and around the bike into one centered, balanced unit. The wolf-pack gave one voice to the chase. The quarry, this strip of blacktop ahead, began to run. To my right, the bay bounded along blocking the highway’s escape, nipping at its side with whitecappped teeth. The road raced forward into the hill that loomed ahead. Cape Lookout’s land mass spilling out into the sea ahead of me and to the right. 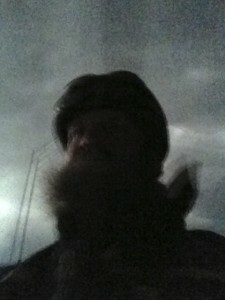 Winter wind buffeted, threatening rain pelted, futile against the oiled leather of my riding gear. This was not their first storm. The forest rose ahead, and the road dove into its cover, twisting, crashing, bucking over road-heaves where the rocks had held beneath, dropping where the winter rains had softened and eroded beneath and cracked the pavement, dropping it into sink-holes. Patiently the pack stuck to the track, into the gloom of the deep old-growth rain forest. Last month’s storms had knocked down trees across the road. Logging debris – mud, bark, crushed needles and chainsaw oil – tried to hide the trail. I gingerly picked my way through the slick, and picked up the scent again where logs were stacked high in a newly cut clearing on the side of the road. Flushed from it’s hiding, the roars burst over the summit of the Cape. We caught up the fresh scent again at the bottom of the lee side of the cape. The road panicked, And broke out in a straight run through the dunes. The bike belled out its guttural howl and surged forward again. What the pack lacks in speed for the chase it makes up for in dogged persistence. The road ran across farmland, dotted with yellow spring daffodils, through bogs and mud flats, over bridges, through town where the dead moved about in shiny cars sullied by rain spray, insulated against weather and life, and finally joined the highway. The sting of rain pelting my face tightened my balance, perfected loping instinctive cadence. The hills faded in my mind. The trees disappeared. There was only this road, and my quarry.